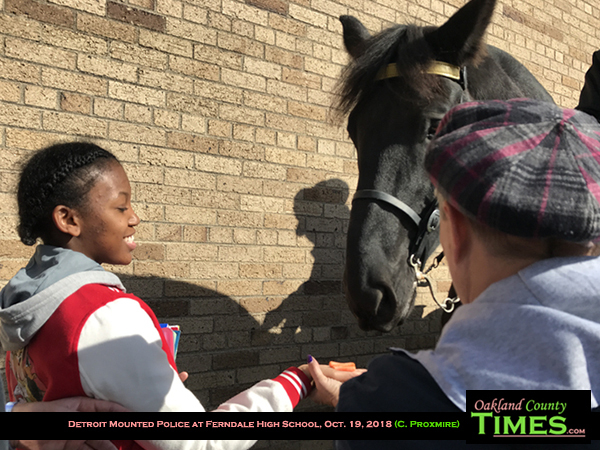 Ferndale, MI – “Horses are very gentle. 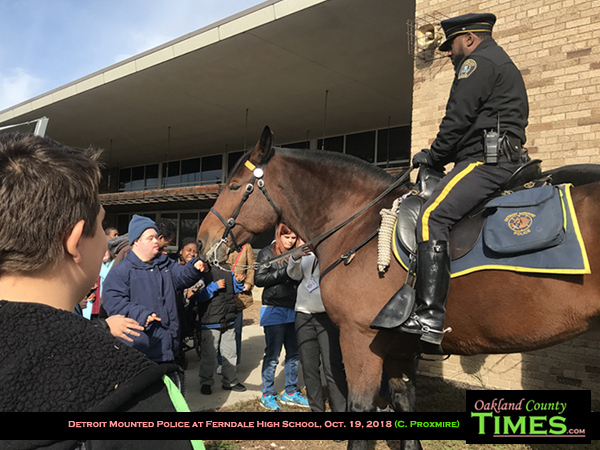 They are majestic,” said Zach Rodriguez after petting the noses of horses that visited Ferndale High School on Friday. 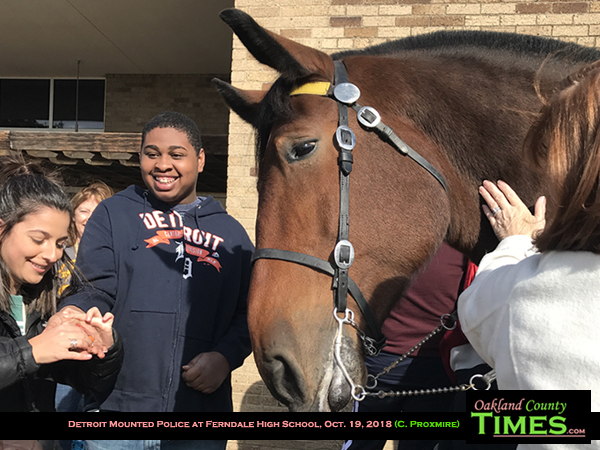 Two Detroit Police Horses and their mounted officers visited kids of all grades in the special education program through Ferndale Schools to give the kids a chance to see the animals up close and interact with the police. “They are so sweet,” Rodriguez said. “They protect us,” he added. 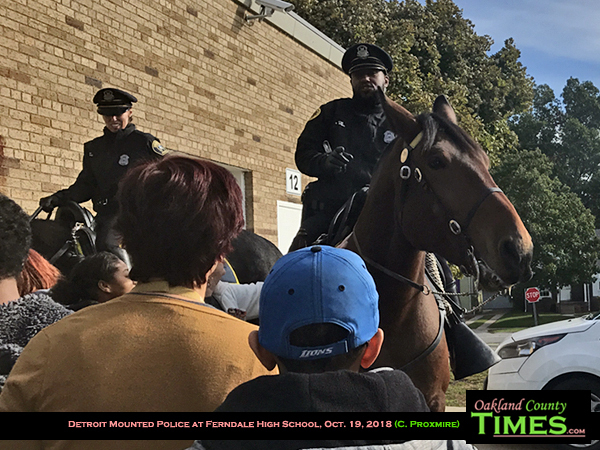 Officers Steen and Sanchez stayed atop the horses while the kids pet and fed them. Nine year old Ivan the Terrible and 13 year old Al Capone are used to being around kids and crowds. 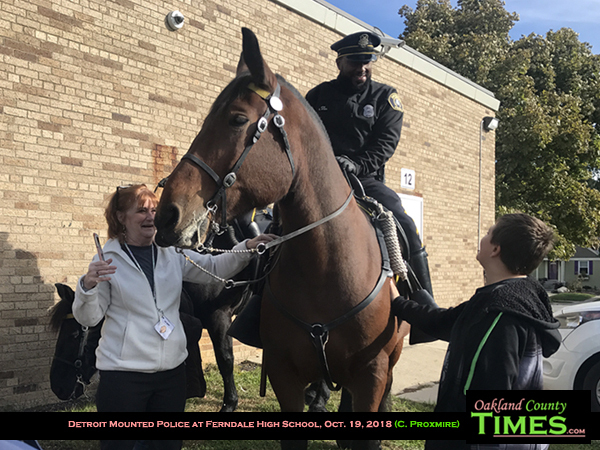 Detroit Mounted Police patrol Belle Isle, Palmer Park, Downtown and Riverfront, Wayne State University, Eastern Market, sporting events, parades and many other large events in Detroit. 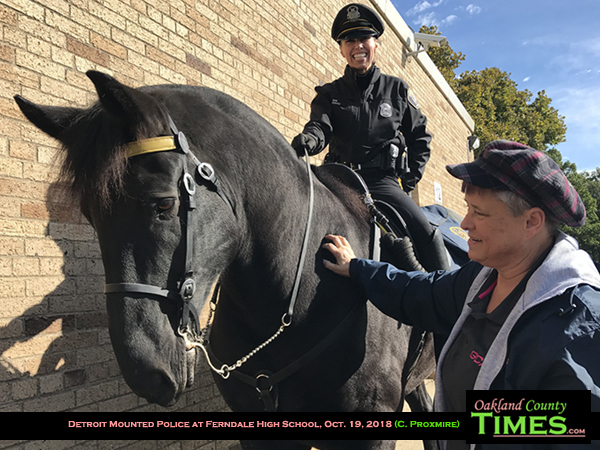 They also help with community outreach. 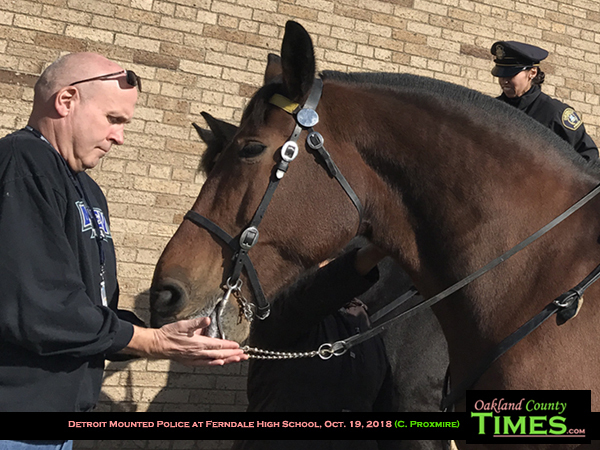 The officers said there are 8 horses in the unit. 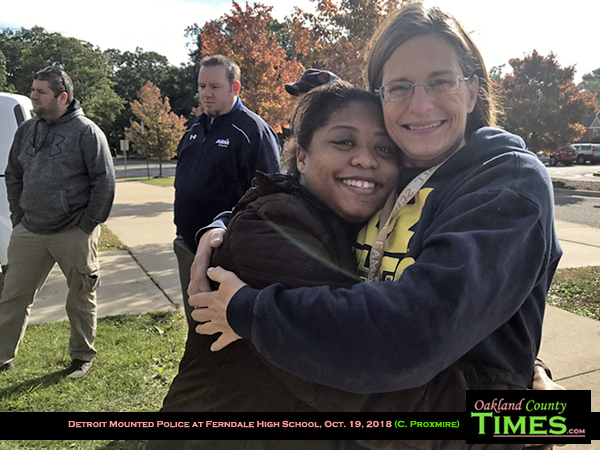 “Sometimes we have to chase down people to catch up to them, but mainly they’re used for crowd control,” Officer Steen said. 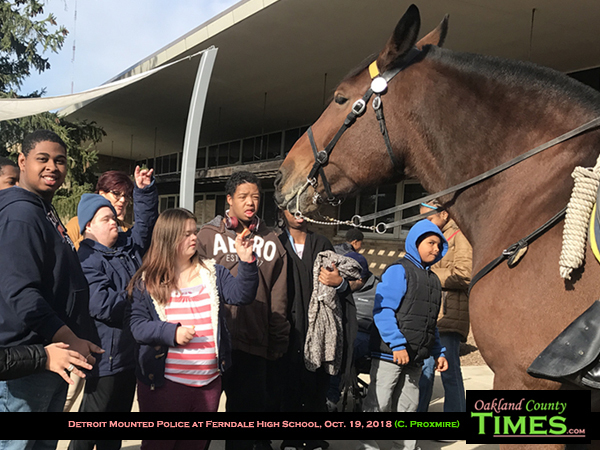 Officer Steen told the kids that he saw a police officer on a horse when he was a kid, and that he put in extra training to become one of the handful of officers in the mounted police unity. 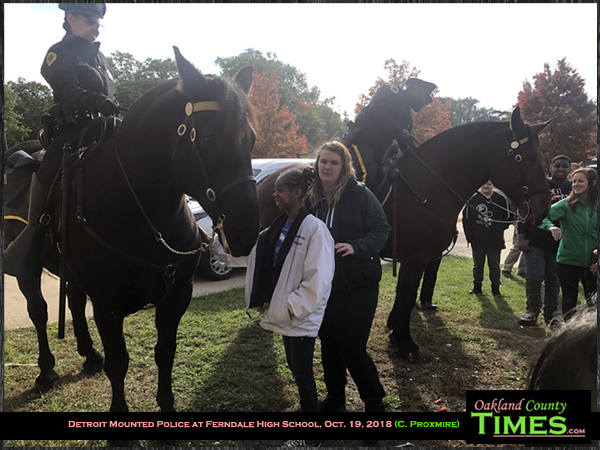 The kids, ranging from elementary to high school and post high school through age 26, loved seeing the horses. 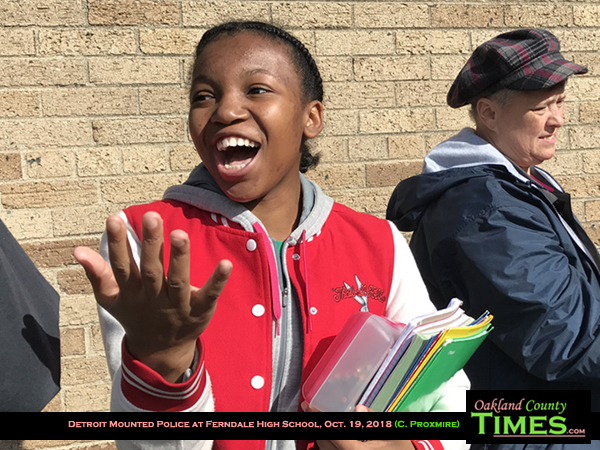 Ms. Jackson said that she and other adults that help with the classrooms try to make sure they do something fun each week. This week the plan is to visit the Detroit Parade Company warehouse to get an up close look at the giant floats.